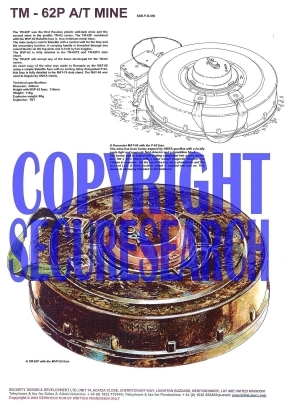 This security poster illustrates the TM-62P Russian Anti-Tank Mine. This anti-tank mine is one in a series of “TM-62” series mines. The mine uses a Bakelite body with a Trotyl (TNT) main charge. When fitted with the MWP-62 fuze the anti-tank mine is described as a minimum metal version. This mine can be fitted with a variety of fuzes common to the TM-62 series of mines. This security poster features the TM-62P Russian anti-tank mine’s specifications, a Romanian MAT-68 with the P-62 Fuze, boobytrapped by UNITA guerrillas, and a TM-62P with the MVP-62 fuze. A Romanian MAT-68 with the P-62 Fuze, boobytrapped by UNITA guerrillas. A TM-62P with the MVP-62 fuze. The TM-62P Russian anti-tank mine’s specifications. This security poster features the TM-62P Russian anti-tank mine's specifications, a Romanian MAT-68 with the P-62 Fuze, boobytrapped by UNITA guerrillas, and a TM-62P with the MVP-62 fuze.